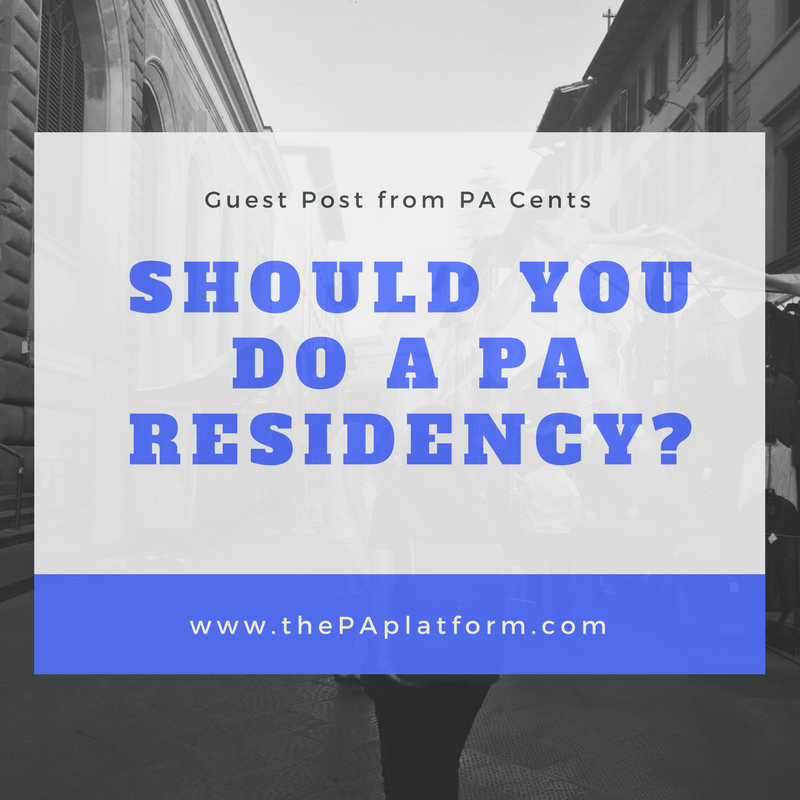 Guest Post from PA Cents: Should You Do a PA Residency? You’re in the final stretch of Physician Assistant school: graduation, PANCE, new job, it’s in your sights. You’ve been looking online at job openings and are not sure if you’re ready to join the workforce and be a full-fledged certified PA, practicing real medicine on real patients; so you think maybe a residency might be a good choice. Possibly you’ve been looking for a job in a competitive area and can’t find a job in the specialty that you want so you want to gain more experience. There is a lot to consider if you’re thinking about applying to a residency. I went to PA school in Southern California where there are a number of PA schools and a large pool of PA graduates to choose from to fill positions. The hospital where my orthopedics rotation was at had a lot of medical students, residents, PA students and PA residents. I asked one of them why they chose to do the residency and she said she was not able to find a job in that location in orthopedics. If you’re tied to a certain area and really want to be in a specific specialty then more training in that area could be helpful and might help you find a job in that specialty. You will get a lot more training and might feel more competent after a residency. A residency is by no means a necessity to get a job in any specialty. After I graduated from PA school I had multiple job offers that were all in different specialties. I interviewed for jobs in orthopedics, neurosurgery, and endocrinology. I ended up accepting a job in general surgery. Surgeons all use different techniques and they all think the way they do it is the best way. My first job was with a surgeon who was getting older, there were four surgeons in the practice and only one used a PA at the time. The surgeon I worked with saw the value of having a PA in the OR, as well as in the office, and with hospital rounds and wanted to hire one too. By the time I left the practice the PA that was working there before me had already left and one of the other surgeons also hired a PA. All of the PAs they hired, including the one that replaced me, were new graduates. An advantage of hiring a new PA rather than one that has been doing it for a while is that they could train them to do things how they wanted it done. They did not have to teach old dogs new tricks. If someone else has trained you then you might have “bad habits” or just do things differently than they are used to. More education is never a bad thing and doing a residency does let you learn more. If you know you never want to do another specialty than taking a year to learn more in that specific specialty can help you learn a lot and possibly be a better clinician. The first year out of PA school is like PA school part II - PA school prepares you to take the board exam and the first year of being a PA teaches you how to be a PA. When you’re looking at a first job you should look for something that is still going to help you along in your education and where there is a good learning environment. This does not need to be a residency. There are plenty of jobs that provide a good learning environment without having to do a residency. The job that I currently work at allows new Primary Care PAs to rotate through different clinics and with different specialties before they start seeing their own patients. Learning is also somewhat dependent on your supervising physician. The surgeon I worked with for my first job didn’t mind teaching/explaining things, but I had to ask questions a lot of the time to get him going. There was another surgeon in our practice who was recently out of fellowship and did a better job of naturally explaining things. I think a part of this was he was just in the habit of doing it as he was used to working with residents and students at a teaching hospital, whereas the further out from training you get the less you’re in that thought process. As a PA we have been trained as generalist and one of the beauties of being a PA is that you can change specialties without having to do more training. My first job was in general surgery and when I was ready to move on I had offers from other places in all different specialties. I was not stuck working in general surgery forever. If some people are doing residencies that may soon become the norm and with residency training for PAs if that becomes the standard we will no longer be generalist and the benefit of being able to switch specialties without more training will go away. If you feel like residency is your only option as you’re not able to find a regular position as a PA, it’s good to know that you’ll probably have to take less money as residencies usually pay less than a regular position. At the 2017 AAPA conference I did talk to a residency for general surgery and they were offering $75,000 which is better than the $40,000 I’ve seen in the past but it is much less than what you could get in a regular position. Whenever you’re looking at a job you always have to weigh the pros and cons. There are some benefits, such as more training and ability to network while you’re in the residency. If you can afford to take less and invest the time to do the extra training it may help you with your skills before taking a regular position. If you’re looking at a first job and have decided to take a regular position be sure that it is a place that supports learning and is going to help you as grow as a new PA. This article was written by the author of PA-Cents a personal finance blog for PAs; to contact the author or for information on PA personal finance visit www.pacents.com.